We're celebrating over 30 years in business serving the Minneapolis, St. Paul, and Twin Cities area, and hold an A+ Better Business Bureau rating. Carpet Cleaning Tips: From the Pros at PRO! We regularly receive calls about area rug cleaning and care, especially for wool, silk, and oriental rugs. This month, in a special interview with Keith, an experienced area rug tech, we'll cover this topic in detail. Ready to demystify area rug carpet cleaning? Let's talk with the PROs! Area Rug Cleaning & Specialty Rug Care! Today we're sitting down with Keith, a lead tech of 18 years, at Professional Carpet & Upholstery Cleaners, Inc. Keith's unique experience with specialty rug care will give us insight into area rug carpet cleaning, and a behind-the-scenes look at the area rug process, tips and unique offering at PRO. Q. Good afternoon, Keith! To begin the conversation, maybe we can start with how area rugs are similar to typical carpet cleaning? Keith. Sure. The similarity is the use of water extraction, which includes four steps: 1) Vacuuming, 2) Application of pre-conditioner/emulsifier, 3) Agitation and 4) Water-extraction rinsing. And, of course, we follow the same furniture moving procedures that we do with regular carpet cleaning projects. There, the similarity ends and specialty work for area rugs begins. Q. So, how are area rug cleaning projects different from typical carpet cleaning? Keith. The difference is in the particular fibers of various types of rugs. Frequently wool, or possibly silk or synthetic carpet blends, change how we approach the use of hot water, or various emulsifiers or stain treatment. To retain color with no bleeding, and still remove stains, careful management of solutions and water temperature is required. This is different for each fiber type or combination. Q. This sounds like it can get a little complex - what can you tell us about your knowledge in this area and in general? Keith. There is an IICRC Certification that includes area rug cleaning, and due to the ever-changing rug fiber construction, popularity of various types of rugs, etc., remaining current with this information is important for us. Additionally, I have nearly 20 years' experience with carpet fiber care, so I rely on that for each project. Q. Sounds like you are ready for anything! Does that include even the more challenging situations, such as pet or odor issues? Keith. Absolutely. We may select a different treatment process, or employ additional solutions, for area rug cleaning with those issues. Q. What should customers expect in those special situations? Keith. If an area rug has average soil, it can be cleaned on site, as long as there is a drying space where the rug will not be in direct contact with wood flooring. With deeper soiling, stains and pet odors, we may request to transport the rug to our location, where we can take extra time to manage the cleaning, stain removal and drying process. This ensures the best possible outcome for area rug cleaning in most instances. Q. 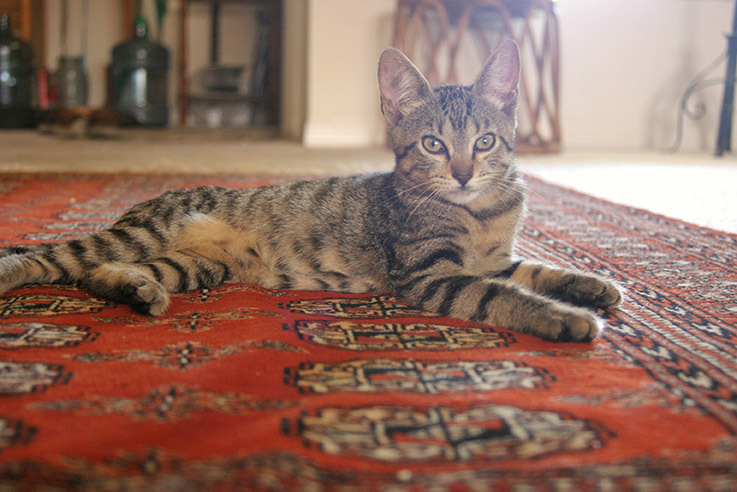 Do you get calls to clean older oriental rugs? If so, are there special care steps you take with those items? Keith. Absolutely. We are very experienced with oriental rugs of all kinds, and as for this type of rug, a 200-year-old rug is just hitting its prime - we're well-versed in the care and management of cleaning in those situations. Q. That's good to know! One other question I have is about drying - are there differences in drying and drying times when cleaning area rugs? Keith. Great question! Drying times are very similar with most area rugs, however it can be of added benefit to schedule on a dry day, have windows open, or place a fan in the room where a rug is drying following cleaning. These steps can reduce color bleeding and rug shrinkage, particularly with oriental rugs where berries and other natural ingredients have been used to formulate the dyes. With regard to wool rugs, wool is highly absorbent and can hold up to twice its weight in water, so it's important to be patient with the drying process. This is another reason for us to transport rugs to our location, to manage that drying process through to completion. Q. Thanks Keith, for your time today! Keith. You're welcome. As always, we're happy to answer your questions about area rug cleaning, or any of our services. If you have questions... Give us a call at 651-645-0244! Custom Carpet Cleaning - Safe and Green! When you call the professionals at PRO, we're happy to accommodate your request for a completely green carpet cleaning! Just let us know you prefer vinegar or plain water over standard carpet cleaning products, and we will happily adapt our process to meet your request. We're interested in helping you maintain cleaning standards that meet the special needs or desires of your household. Just ask! All tips provided by Professional Carpet & Upholstery Cleaners are recommendations for a best-practice process and may not be indicated for certain types of fiber. Please check with your manufacturer, manufacturer's warranty or call the professionals at PRO with any questions about the application of this process. This tip is presented as a guideline only, and Professional Carpet & Upholstery Cleaners does not warranty or guarantee results of this process unless recommended for the specific fiber type upon inspection. Your Minneapolis, St. Paul, and Twin Cities metro area carpet cleaning experts! contact us | © copyright 2019 Professional Carpet & Upholstery Cleaners, Inc. All rights reserved. Professional Carpet and Upholstery Cleaners, Inc. provides carpet and upholstery cleaning, window treatment and drapery cleaning, leather care, water damage restoration, stain removal, fine area rug cleaning, commercial carpet care, and tile & grout cleaning for residential and commercial locations. We have been in business for over 30 years, and hold a BBB rating of A+ and an Angie's List rating. We serve Minneapolis, St. Paul, and the entire Twin Cities metro area, including Bloomington, Richfield, Edina, Eden Prairie, Shakopee, Savage, Chaska, Prior Lake, Chanhassen, Minnetonka, Minnetrista, Excelsior, Deephaven, Plymouth, Maple Grove, Golden Valley, St. Louis Park, Anoka, Blaine Ham Lake, Lino Lakes, White Bear, Shoreview, Roseville, Oakdale, Lake Elmo, Stillwater, South St. Paul, West St. Paul, Woodbury, Afton, Cottage Grove, Hastings, Lakeville, Rosemount, Apple Valley, Eagan, Inver Grove Heights, and all Twin Cities metro area suburbs. Please contact us for information about our services at 612-331-1616 (Minneapolis) or 651-645-0244 (St. Paul & St. Louis Park).